Introduction: Anatomic failure and recurrent gastroesophageal reflux (GERD) following fundoplication is a well described occurrence. Occasionally, reoperative surgery is required. The morbidity of revisional GERD surgery can be quite high, and the clinical outcomes may not be as good as is observed following primary antireflux operations. Methods: Data was obtained from a prospectively maintained foregut surgery database and via follow-up survey. Patients to undergo surgery for recurrent GERD following a previous fundoplication were included. A control group consisting of the same number of patients undergoing a first time fundoplication for GERD was randomly selected from the same database. All revisional patients had anatomic failure of a previous fundoplication with recurrent reflux symptoms. The diagnosis of recurrent GERD was confirmed via both endoscopy and esophageal impedance in all cases. Several patients also had symptoms related to gastroparesis documented on a gastric emptying study. Perioperative outcomes were compared between study groups. Satisfaction with the results of surgery was assessed using a Likert scale (4= very satisfied, 0=very dissatisfied). Results: From February 2003 to April 2009, 26 patients underwent redo antireflux operations at our institution. The majority of patients were female (65% redo vs. 69% primary, p= 0.77), with mean age of 47 years for both groups (p= 0.93). Body mass index (28 kg/m2 redo vs. 30 kg/m2 primary; p= 0.13) was similar between study groups. 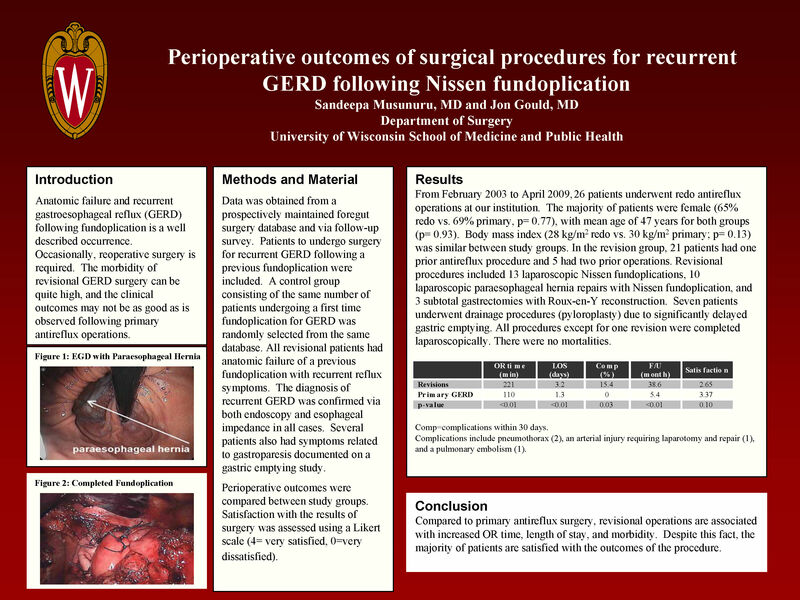 In the revision group, 21 patients had one prior antireflux procedure and 5 had two prior operations. Revisional procedures included 13 laparoscopic Nissen fundoplications, 10 laparoscopic paraesophageal hernia repairs with Nissen fundoplication, and 3 subtotal gastrectomies with Roux-en-Y reconstruction. Seven patients underwent drainage procedures (pyloroplasty) due to significantly delayed gastric emptying. All procedures except for one revision were completed laparoscopically. There were no mortalities. Complications include pneumothorax (2), an arterial injury requiring laparotomy and repair (1), and a pulmonary embolism (1). Conclusion: Compared to primary antireflux surgery, revisional operations are associated with increased OR time, length of stay, and morbidity. Despite this fact, the majority of patients are satisfied with the outcomes of the procedure.